There are some writers and illustrators whose greatness reduces me to the mental state of screaming Beatles-girl. Bob Shea, with his efficient seven-letter name, is one such author-illustrator. I adore his books. I make teenaged children listen to NEW SOCKS because I don’t have little kids at home anymore. BIG PLANS made me snort out loud in semi-grotesque fashion. And in the Dinosaur, we have the joy of a character who keeps coming back. I think Bob’s upcoming title with Hyperion (read on) has the potential to be my favorite–it’s a book I already wish I wrote, based solely on title envy. If you don’t know all of Bob’s work, fix that immediately. He’s on my very short list of absolute favorites. But before you run out and buy all his books, read this. 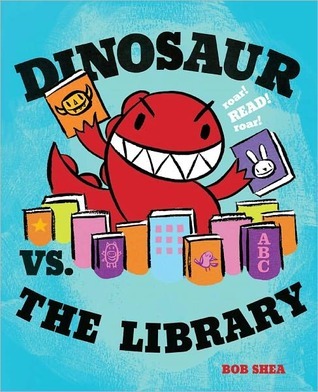 Has the dinosaur found a worthy opponent in the library? When you’re thinking about potential titles, let’s say in the dinosaur series, does it come to you verbally or visually first, or are they all entwined? Well, there are lots of places Dinosaur is allowed to roar, the library isn’t one of them. The first version had Dinosaur getting shushed at every turn but I didn’t want to reinforce that tired stereotype. A visit to the beautiful Cambridge library reminded me that libraries are dynamic, lively places and not stodgy and stiff. Kids naturally love visiting the library and I made sure I portrayed it that way. As far as potential titles, it’s a mix. I may doodle a little character, or think of a line for a story. I am a prolific sketcher, so my notebook is always full of something. Not good, just something. So I really have no set process, I’m just trying to get the story out. I always find it fascinating when a writer/illustrator only writes or illustrates some titles but does both on others. Why didn’t you illustrate BIG PLANS? And why didn’t you write ME WANT PET? I didn’t illustrate BIG PLANS because Lane Smith showed an interest in doing it. Have you heard of Lane? He’s done a book or two himself. So when he said he was interested I said yes as soon as I regained consciousness. I didn’t write ME WANT PET because Tammi Sauer did such a good job. Had I written it, the caveboy would spend the whole book riding dinosaurs which is historically inaccurate. Tammi’s version where the caveboy looks for the perfect pet and meets resistance from his family is much more in line with how life was back then. Google it, you’ll see. Were you a big reader as a child? Were there any characters you wished would move next door to be your new best friend? I was a big reader, which was not as common as it is now. I remember other kids being surprised when I would read just for fun and spend time in the library. I loved Encyclopedia Brown and The Great Brain Series. I think the first book I really remember liking was THE CRICKET IN TIMES SQUARE. The Silver Sword was a big one for me as well. Live next door? Not really. Those Silver Sword kids had it pretty rough. Is there any book you wish you’d written? Any book you wish you had the chance to illustrate? Right now the book I wish I had written is I WANT MY HAT BACK, by Jon Klassen. I can’t though because I’m not smart enough. This Klassen fella is a clearly a genius. Art, story, typography, overall design all perfect. Oh, and it’s funny! Oh, and it gets worse. I met this Klassen person one time and HE’S REALLY NICE! What’s up with that! The only thing I can hold against him is that I think he’s from Canada. Hard to work up a good angry head of steam over something like that. Eh, I’ll make it work. I also like STOP SNORING, BERNARD by Zach OHora. The illustration is the really, really good kind. That’s the smartest way I can say it, I am slack jawed by its brilliance. A guy that good is probably mean to birds. Has to be. You know who else I’d like to punch in the face? I mean, whose work I like? Peter Brown. I’m pals with Lane Smith and sometimes I forget he’s Lane Smith. We send each other funny links or joke around then he sends me an image to check out and it hits me. “Oh yeah, you’re Lane Smith!” He’s my favorite. So, Mr. Big Plans, what’s in the pipeline and what are you working on? There are a couple more adventures with Dinosaur on the way. I’m doing a book called CHEETAH CAN’T LOSE with Balzer+Bray. It’s about a Cheetah who races some little cats. The cheetah always wins until the cute little cats even the odds. Also, UNICORN THINKS HE’S PRETTY GREAT for Hyperion. There’s a new, magically popular unicorn in school and goat is none too happy about it. Luckily, unicorn is pretty cool and notices the great stuff about goat like those fantastic hooves. They’re cloven! I’m also illustrating a series for the ridiculously talented Charise Harper. She’s funny and nice. I think she is terribly underrated. I find these hilarious titles of hers and think, “Why is this not given out when you sign up for a drivers license? It’s hilarious!” She reminds me a lot of the hilarious and talented Laurie Keller. Not just because they are both girls, which they totally are. Are you slack-jawed by brilliance now too, reader? Are you tired from Beatles-girl screaming? When you recover, go buy Bob Shea’s books. Learn more about Bob by visiting his website. This entry was posted in Uncategorized and tagged A Cricket in Times Square, Big Plans, Bob Shea, Charise Mericle Harper, Cheetah Can't Lose, Dinosaur Vs. The Library, Encyclopedia Brown, I Want My Hat Back, Jon Klassen, Lane Smith, Laurie Keller, Me Want Pet, New Socks, Peter Brown, Stop Snoring Bernard, Tammi Sauer, The Great Brain, Unicorn Thinks He's Pretty Great, Zachariah OHora. Bookmark the permalink. Thanks for hosting Bob the Great. I love the cover of “I Want My Hat Back.” So adorable. Bob Shea at the Texas Book Festival on You Tube = hilarious! Love Bob Shea! And that’s such a fun title for your post, Audrey. Indeed, we’re the ones who should be slack jawed at Bob’s brilliance. Although it makes him seem so much more down to earth and accessible because HE’S impressed by another illustrator’s genius. What a great guy!